While Part One dealt with the two museums tracing the history of Lane County, this article will dwell on the two located at the University of Oregon. UO is known for their fighting ducks football team which has received national recognition in the past few years. Their two museums, Jordan Schnitzer and the Museum of Natural and Cultural History are also prestigious. 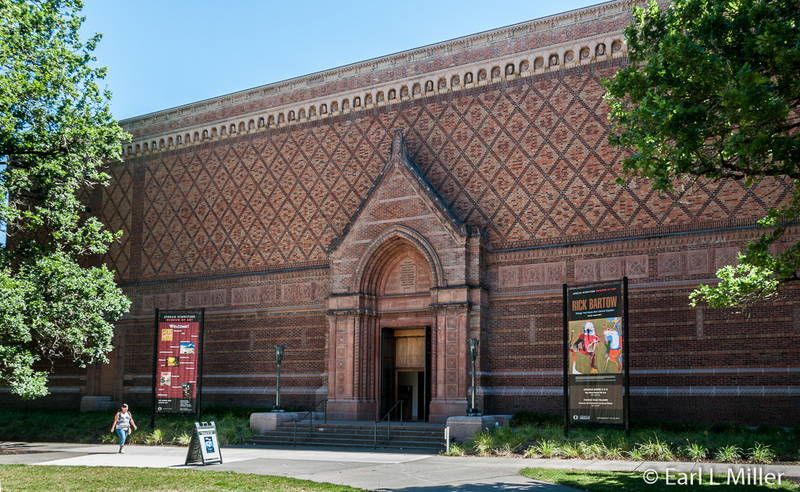 The Jordan Schnitzer Museum of Art, on the University of Oregon campus, opened to the public June 10, 1933. 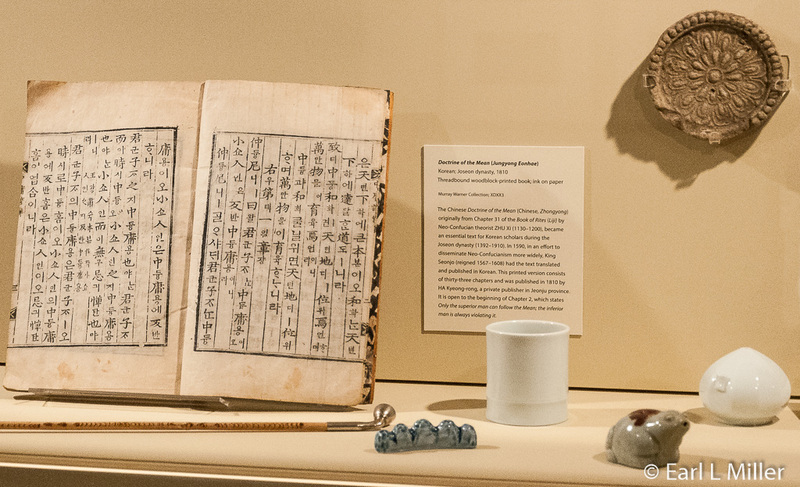 Its purpose was housing the Murray Warner Collection of Oriental Art consisting of more than 3,700 objects. Gertrude Bass Warner, in 1921, gave these to the university as a memorial to her late husband. The original collection primarily represented the cultures of China and Japan where the Warners had traveled. The building is listed on the National Register for Historic Places. 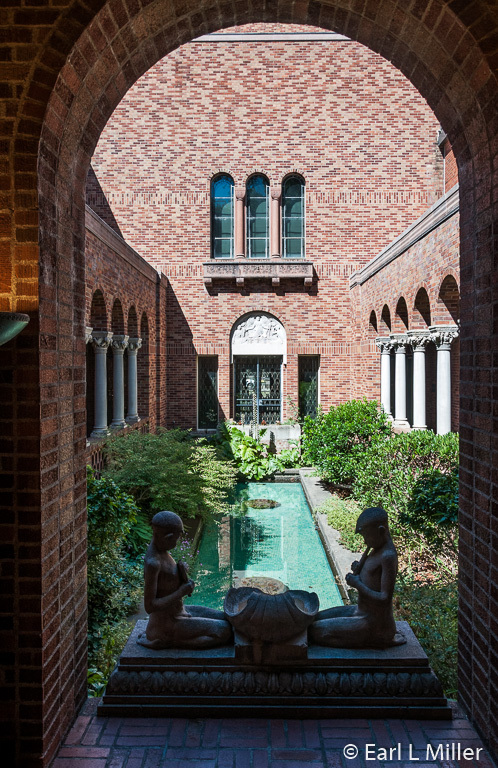 It has exterior brickwork, decorative moldings, and iron grillwork, as well as the Asian-inspired Prince Lucien Campbell Memorial Courtyard with a statue of Lucien Campbell, UO’s president in 1993. The museum touts their home as one of Oregon’s most distinctive architectural structures. Jordan Schnitzer is one of six museums, including the only university museum, in Oregon accredited by the American Alliance of Museums. 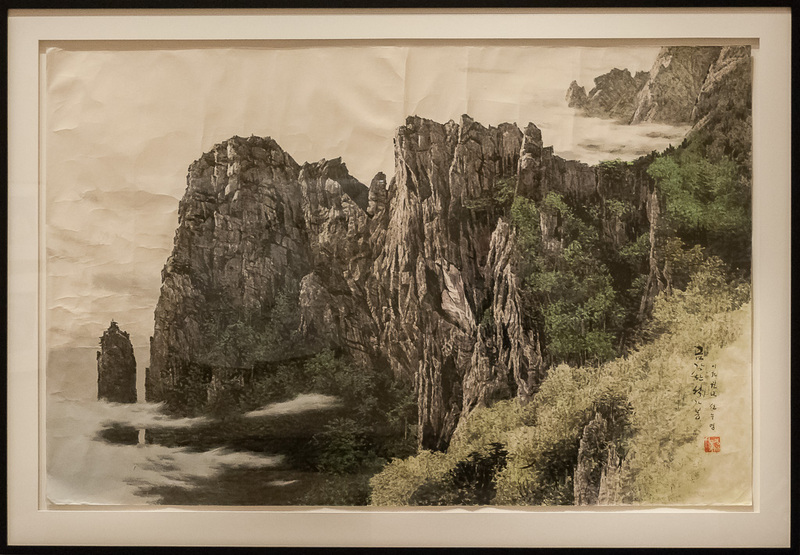 Its reputation is based on its extensive holdings of Chinese, Japanese, Korean, and American art. In October 2002, the museum doubled their space and collection storage. After reopening in 2005, it hosts several installations from its collection of more than 13,000 works as well as changing exhibitions. In 2012, the museum opened its first European gallery. Artist Project Space, its first floor gallery, displays work by contemporary artists, from its collection and special loans. Its exhibit consisted of Mexican folk art, when we were there, featuring images of worldwide domestic and wild animals. The first floor also houses the museum store and café, lecture hall, and reception area. This is also the place to gather Art Packs. These provide free admission to families if they obtain them when they arrive. Some subjects which are offered to increase one’s understanding are Asia, Artful Animals, and Learning to Look which deals with the basics of art. The museum has a Guide by Cell. These provide information by the museum director, artist, and curator about the works you will see using your cell phone. Look for the Guide by Cell logo on text panels and labels for more information. Another option consists of a free guided tour on the first Saturday of the month at 1:00 p.m., which is free with museum admission. It lasts approximately 45 minutes. You’ll find the rest of the galleries on the second floor. Exhibits change often, sometimes once a month, while others can last several months. 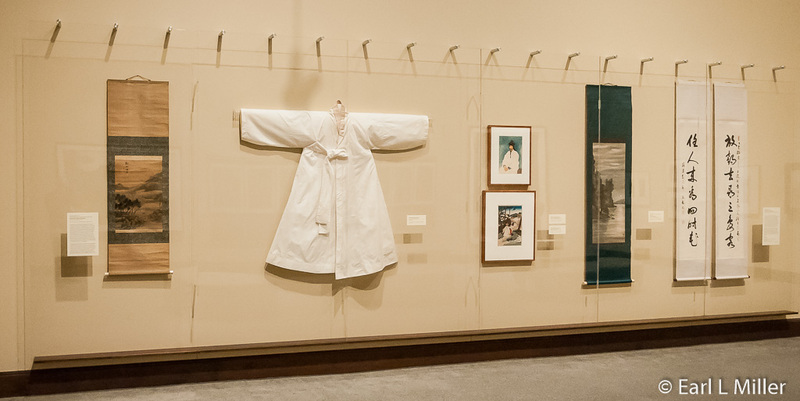 The displays in the Korean galleries change yearly. The Barker Gallery, the museum’s largest space, hosts four major exhibits annually. When we were there, we viewed the work of Rick Bartow, an Oregon artist from Newport. He is a member of the Wiyot tribe of California. 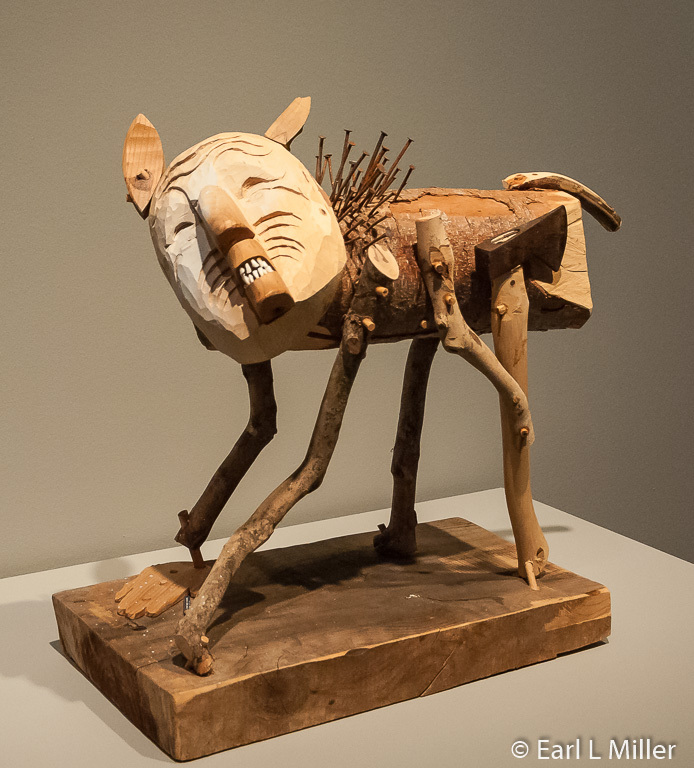 It was an exhibit covering 40 years of his work titled “Things You Know But Cannot Explain” in a variety of sculptures, paintings, drawings, and prints. His personal experiences, cultural engagements and global myths, especially Native American transformation stories, are the heart of his art. This has now been replaced by an exhibit of contemporary Japanese prints. 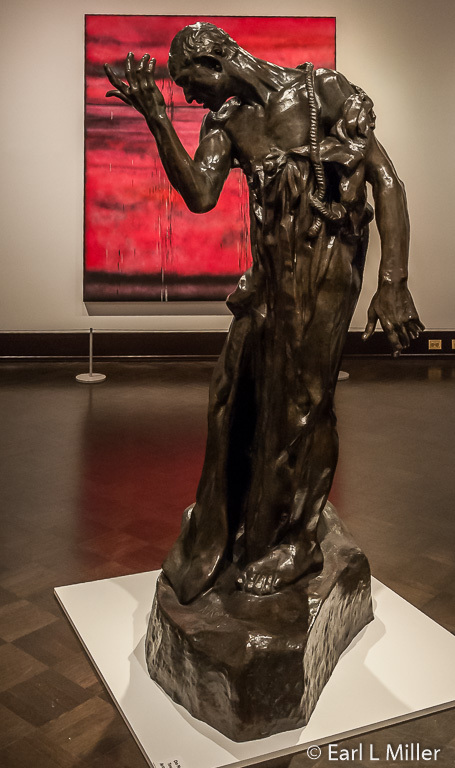 The Focus gallery features Masterworks on loan such as paintings by Andy Warhol or a sculpture by Auguste Rodin. We saw both. The Graves Gallery is home to the largest collection of works on paper by internationally acclaimed Modern painter Morris Graves. He was from the Pacific Northwest. 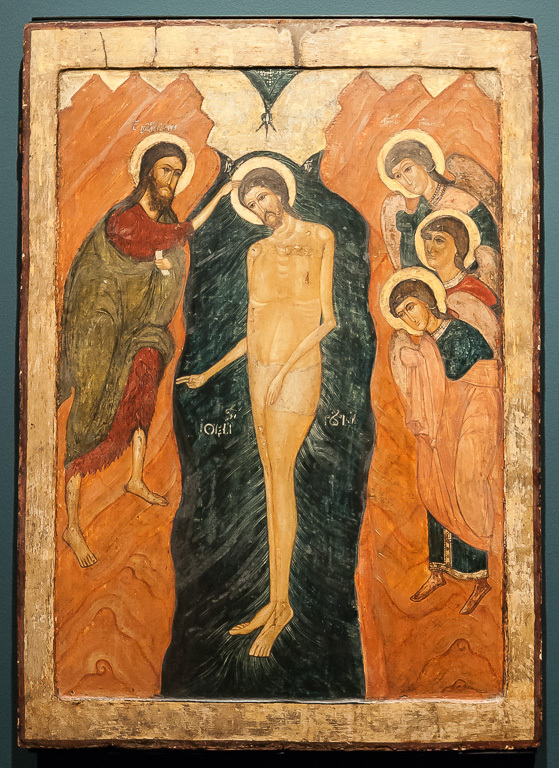 The McKenzie Gallery is known for its Orthodox icons, dating from the 15th to the 20th centuries, and Russian Art. This changes once or twice a year. The Preble/Murphy Wing consists of two galleries displaying art from Japan. It contains more than 3,000 Japanese prints, traditional paintings in screen and scroll formats, Buddhist sculptures, ceramics, textiles, arms and armor, dolls, and more. 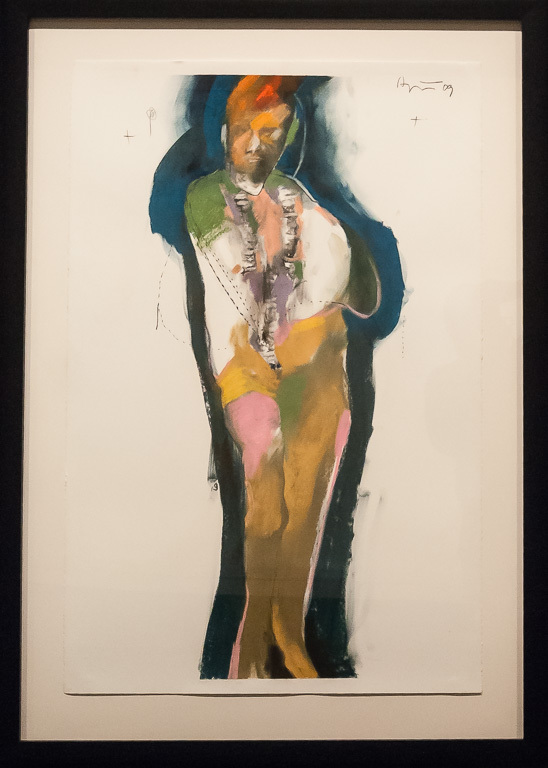 The Schnitzer Gallery recognizes art from the Americas including American artists from the 20th and 21st centuries, with a strong emphasis from the Pacific Northwest. It’s the repository for nearly 300 WPA federal works commissioned through New Deal art projects. The Soreng Gallery is devoted to works from China. According to our guide, Debbie Williamson Smith, Communications Manager, these consist of traditional Chinese paintings, sculptures, ceramics, jade, glass, lacquer, metalwork, furniture, and Chinese objects. Unfortunately, this was not open when we were there due to the exhibit being changed. The MacKinnon Gallery is home to European art. Part of the new space is dedicated to decorative arts consisting of a collection of silver and metalwork. It includes silver made in Chicago, Mexican silver jewelry, and a diverse collection of silver serving utensils. Admission to the museum is $5 for adults, $3 for seniors, and free for those ages 18 and under. Hours are Thursday through Sunday 11:00 a.m. to 5:00 p.m. and Wednesday from 11:00 a.m. to 8:00 p.m. Parking spaces are located behind the museum and parking passes can be obtained from the public or security entrance. Its address is 1430 Johnson Lane and its telephone number is (541) 346-3027. 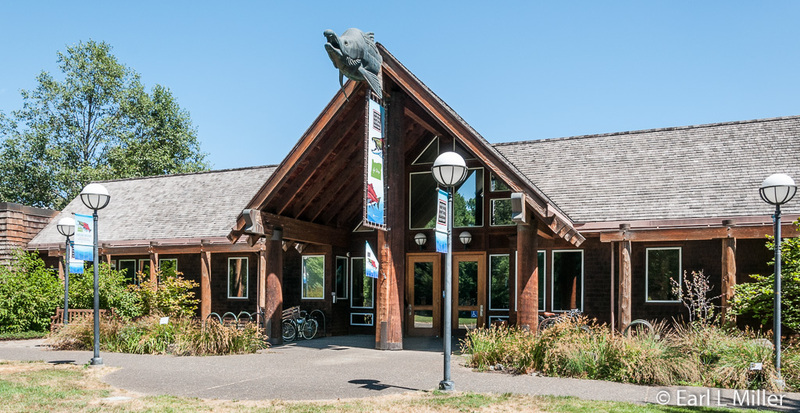 Established in 1936, this museum, located at the University of Oregon, focuses on four sciences: geology, zoology, paleontology (fossils), and anthropology. It does it through its collections and exhibits as well as ongoing research. Most of the collection is kept in a vault. At any one time, visitors see only a small portion on exhibit.. 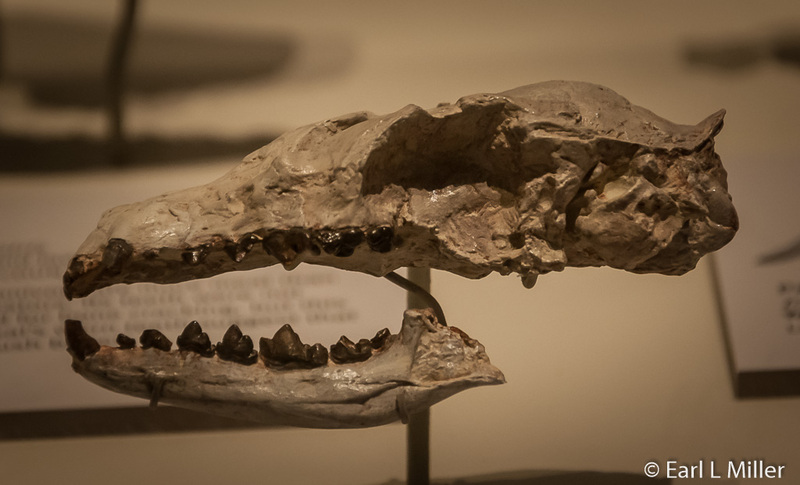 The paleontology collection contains fossils from all the continents including several specimens from Australia and Antarctica. 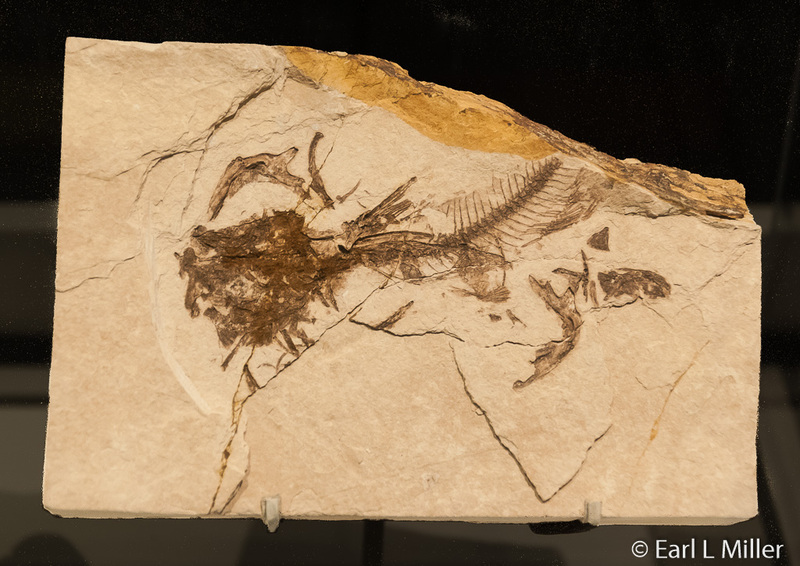 It had its beginnings in 1876 with the personal fossil collection of Thomas Condon, University of Oregon’s first professor of Geology and Natural Sciences. He worked at the John Day Fossil Beds. Many are mammals although it also includes significant numbers of other vertebrates, invertebrates, plants, and microfossils. The majority of these fossils are from Oregon..
One of its two major permanent halls is Explore Oregon which opened in May 2014. 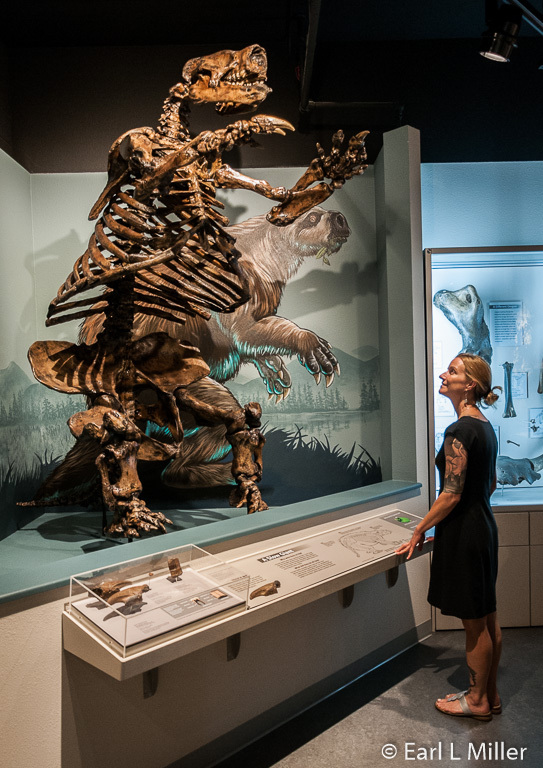 It has an extensive display of fossils and provides an opportunity to meet the sabertooth salmon, giant sloth, and other animals dating back as far as five million years. The exhibit also covers the evolution of the horse and dog. You’ll find a display on the explosion of Mount St. Helen. One interactive allows you to scan rock specimens and learn immediately their age and where they were found. Other displays deal with evolution, geology, plate tectonics, and climate change. 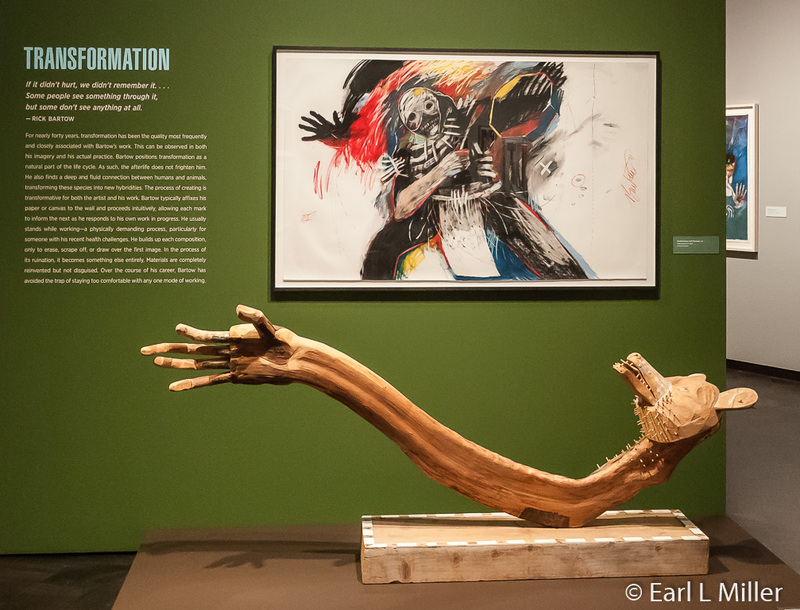 Oregon - Where Past is Present is an anthropology exhibit. According to Kristin Strommer, Communications Manager, this exhibit will be redone in the next year to become much more interactive. Currently it houses dioramas of four geographic regions of Oregon, each at a different time in history and a different season of the year. The Great Basin portrays autumn 6,000 years ago. You can view a traditionally made wikiup and a cache of tui chubs, which is a food staple. The Columbia Plateau illustrates one of North America’s largest Native American fishing and trading centers at Celilo Falls during the summer fishing season, some 250 years ago. Visitors can view the span of a fishing net used at the Falls for more than10,000 years. The Pacific Coast environment includes a replica of a traditional plank house situated in a village at the mouth of an inland estuary around 1,500 years ago. Western Valleys consists of a mural of Native women gathering camas roots during the spring season in a valley, surrounded by an oak savanna and a pine forest, some 1,000 years ago. The museum’s collection traces more than 14,000 years of human history. It includes archeological and ethnographic objects from around the world. The ethnographic collection represents recent peoples and consists of hand-crafted items including textiles, weapons, and musical instruments. Again, keep in mind, that visitors only see a fraction of the collection. In this section, you see a lot of fiber objects made out of sagebrush and other natural fibers. The oldest shoes, ever found, 10,000 years old, are displayed. Made of sagebrush bark, they were named the Fort Rock sandals since they were found at Fort Rock Cave under Mount Mazama ash. This is ash from the volcanic explosion that formed Crater Lake. We also saw the multiple warp sandal of Tule which was 2,330 years old. The Jensen Arctic Collection was brought from Western Oregon University. It portrays the cultures and ecosystems of the Arctic. It’s touted as one of the largest assemblages of Arctic material in the lower 48 states. It also contains artifacts from the Aleutian Islands including two skin-covered Aleut kayaks, probably the last of their kind made by Aleutian Native people in the traditional manner. The entire pan-Arctic Jensen Collection is about 5,000 artifacts total. They come from all eight Arctic countries. 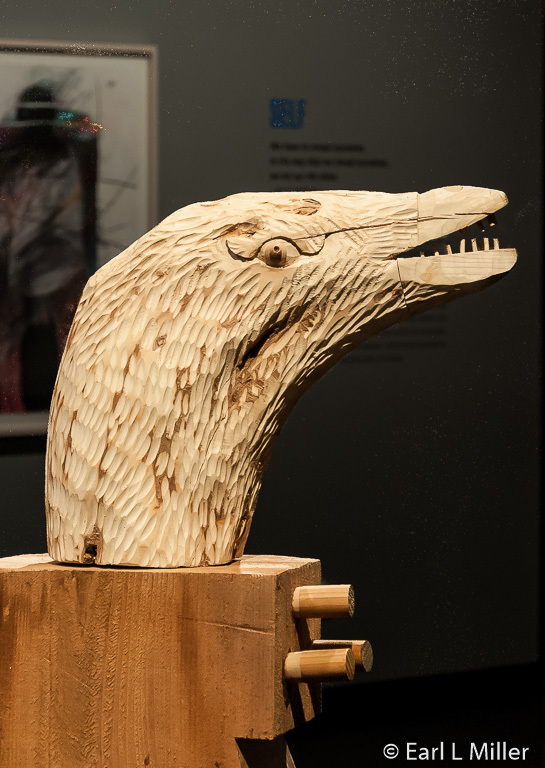 What is on display is only a tiny portion, but you can see such items as Snowy owls, a stuffed wolf and baby, mukluks, masks, ivory carvings, and baleen baskets. You can’t miss the standing Kodiak bear. Site Seeing: Snapshots of Historic Archeology in Oregon covers stories ranging from a 19th century working class family in Portland to Chinese immigrant experiences in Jacksonville and John Day. It also covers a Klamath Homestead in Beatty and the Stevens Cemetery with its forgotten pioneers in Springfield. These came from five historical sites that were recently excavated by museum archeologists. Some of the displays are interactive. For example, all ages can don a lab coat at Scientific at the Core and play at being scientists as they follow the principles of scientific inquiry. Hours are 11:00 a.m. to 5:00 p.m. Tuesday through Sunday. Admission is $5 for adults, $3 for seniors ages 62+ and for youth ages 3-18. Admission is free to the public the first Friday of each month. Exhibit talks ranging from adaptation to the geology and cultural history of Oregon are offered daily at 2:00 p.m. and included with admission. The address is 1680 East 15th Avenue and the telephone number is (541) 346-3024. 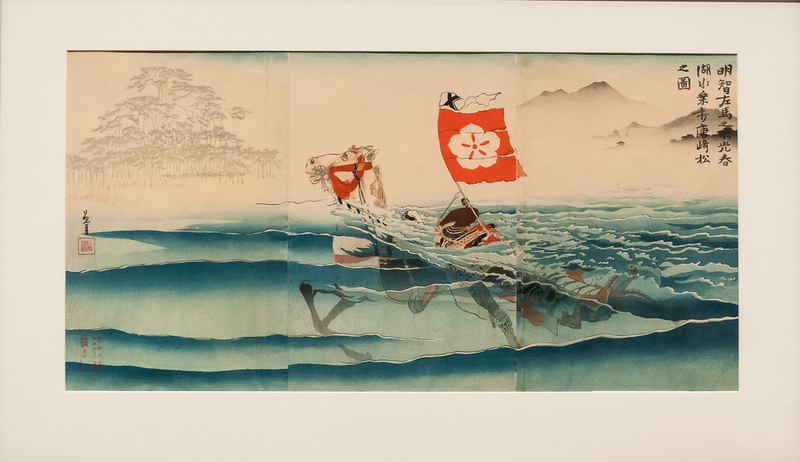 "Mitsuharu and Horse Swimming Across Lake Biwa to the Karasaki Pines"
The Museum of Natural and Cultural History Has an Extensive Fossil Collection. This is the Fossil of an Ancient Catfish. 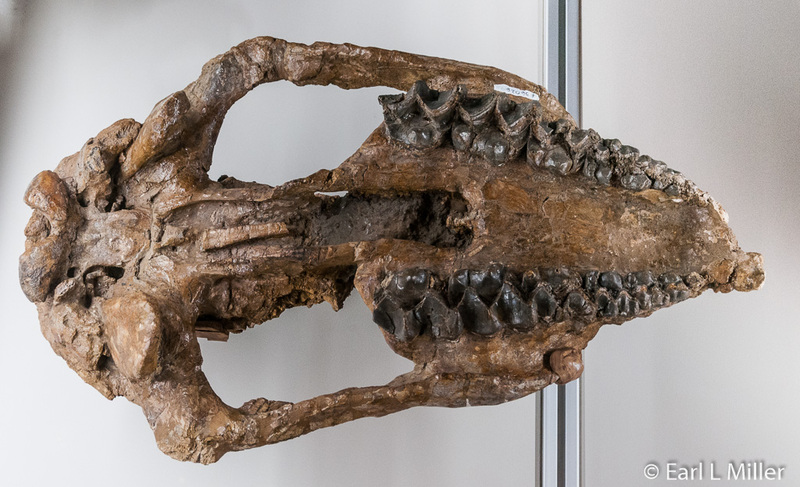 This is a Brontothere Skull. Comparative Anatomy is Important at the Museum of Natural and Cultural History. 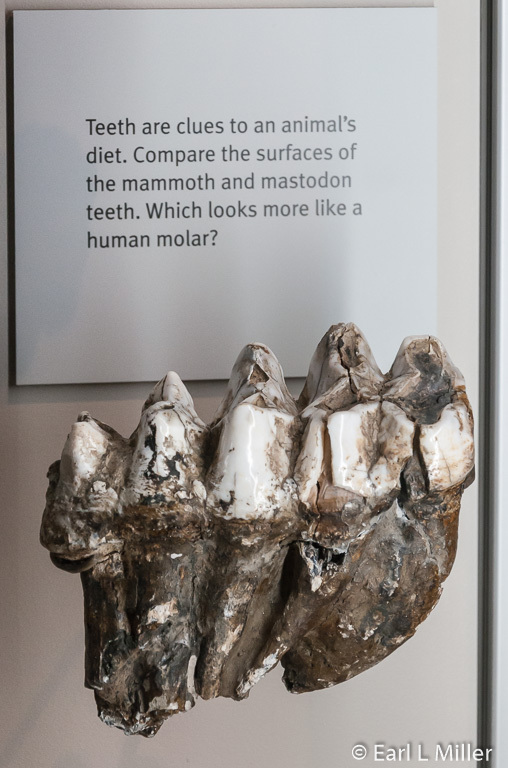 This is a Mastodon Tooth. 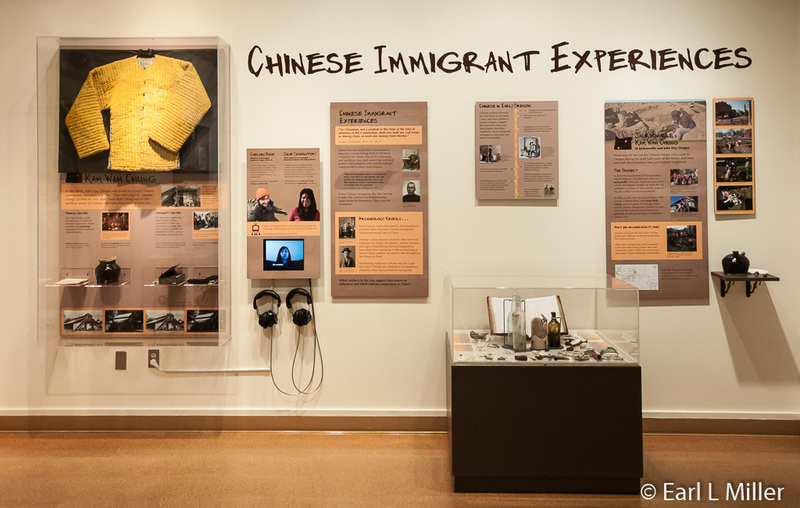 The Museum's "Snapshots of Historic Archeology In Oregon" Contains a Display on Chinese Immigrant Experiences at John Day and Jacksonville.